When I travel I often stop by local facilities to check out the Spinning® talent. You can learn something from everyone, sometimes it's a new cue, a twist on a profile, and sometimes it's what not to do. 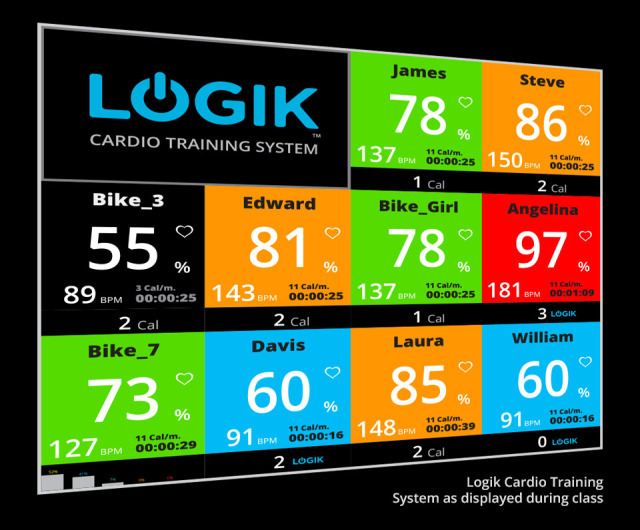 On a recent trip to Dayton, Ohio, I was invited by a former colleague to try out Logik™. What my buddy had told me in advance was simply that it was a new facility and that everyone gets a heart rate monitor to see how well you follow the designed profile. What I experienced was so much more than a simple heart rate emphasized class. Disclaimer: I am interested in all things "geek" so I was excited about a different experience than a normal sweatfest that I find when I usually travel. Even though I would categorize Logik as boutique-style facility I was expecting the same type of gym front end with a desk to welcome guests, sign a waiver, etc... At my buddies guidance I had registered the evening before so they had all my waivers and personal information in advance, and even prior to my visit, at the direction of my buddy I received an email telling me what bike I was assigned and that I should arrive 15 minutes before class for instruction and setup. When I first walked in to their 12,000 sq/ft facility I knew I was in for something different. While that typical welcome desk was present, my attention was immediately fixated on the ceiling. This place was an actual bike shop, and not just the typical shops that I visit that emphasize general consumer bikes, this was a place that catered to athletes. Most shops have hybrids and road bikes, while logik had more than a few TT (time trial) triathlon bikes. Once I managed to pull my gaze away from the bikes, I was able to visit a touch screen kiosk to check in and I was issued my heart rate monitor. And here's where I made my mistake, use their equipment and leave your monitor equipment at home; but more on that later. I then changed clothes in preparation for the ride and then my friend gave me a brief tour of the facility. 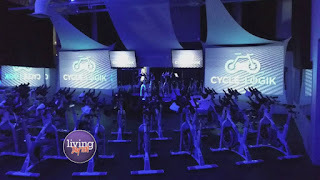 In addition to cycling they have a small but adequate weight training area, a TRX area, a kickboxing area, an open area that they use for some various classes such as a core class, and a separate yoga studio. Everything was as you expected, clean, new and well kept. At this time I wasn't able to view the actual cycling studio because a "drop-in" session was in progress. This was not an instructor lead ride, so I have no clue what the feel of the room was or what was on the monitors. Instead I was introduced to the evenings cycling coach, Dave Cox. With a few minutes left before our pre-class time, I visited the on-site cycling shop where they were working on a bike rebuild and a couple of different tune-ups. The number of bikes they had queued up to work on leads me to believe they must do really good work, which my buddy confirmed was the case. Then there's the bikes; They use Schwinn magnetic resistance bikes. The facility's owner, Jamie Raddin actually came over and set me up on the bike. At first I was concerned in how he adjusted me as it was certainly a different technique than what I use for my classes, but I deferred to his experience. He then explained how and why he fit me as such and I will say that once I started spinning, I have to agree that on that bike I was definitely in a better position than I would have been using my normal method. The handle bars were such that I most likely would have hit my knees, which is exactly what he said he was trying to avoid. That's a crack on Schwinn and not on Logik. It wasn't an issue for me as I'm used to being prone on a bike, but a new comer might find it uncomfortable. 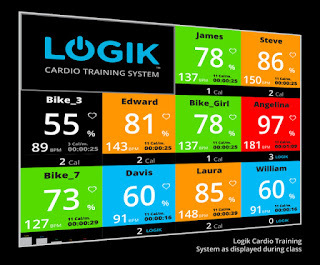 Class started with several "last calls" for riders and 2 projection screens listed all the participants and their heart rate as a % of MHR. Jamie tells me that they have their own calculation for what this is for new participants, but I simply gave them my numbers and we were off. Class started as you would expect with a nice long warm up. The center projection showed a pseudo-profile of the ride. I say pseudo because instead it was more like taking the heart rate response chart that you've seen on my profiles and then looking at them from the top down. You don't really see that your heart rate is going up, instead you see the different zones that your going to be in as colors on a single bar. This was simply a different way to present this information and not necessarily bad. This definitely stresses staying within your heart rate zones. My only concern with this is that it doesn't allow for differentiation in Zone 4, above and below threshold. I was warned that there was a potential interference between my normal Garmin heart rate monitor and their Wahoo TickR's all using ANT+ communications. I assumed that if this would happen that if I simply unplugged my monitor everything would be fine. No! The interference is with the Garmin watch itself and it resulted in my projected numbers on the screen being firmly planted at 65-70%MHR no matter what I did. At first I thought I maybe gave them the wrong MHR, but when I couldn't budge the numbers I knew there was something else wrong. When I swapped the chest strap for an armband and it didn't resolve I just gave up and watched my Garmin. In an effort to fix the communication problem that my watch had posed, the attendant in "Mission Control" locked up their system momentarily. Our instructor, Dan Cox, didn't miss a beat. They projected a 1st person video of a ride through the Bavarian Alps and he kept riding his profile. When they recovered, everyone (except yours truly) was back to the heart rate tracking game. Below is a magnified view of the information they project in the room. You can provide them any name you like to maintain anonymity. After class, I commended Dan on his cuing and profile recovery. Any instructor doing this long enough is going to have problems, it's how we spin with them that defines the experience. Someone then came around and gave each of us a cool, wet towel (that's part of boutique experience) and we were left to our own. I learned that a 2-1/2 page summary of the workout is immediately emailed to each participant. The detail in this report was incredible, and I only wished mine had worked so I could share it with you. 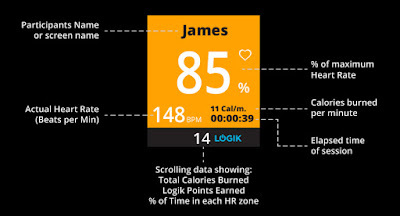 Based on the information in the report you can customize your workouts to meet your specific goals, such as endurance, weight loss, etc... And finally, I learned that they dynamically adjust your heart rate zones based upon your trending on multiple workouts; a completely unique characteristic of their algorithms. I put it akin to having your handicap in golf adjusting and fine tuning the more rounds you play. The advantage here is that you're not periodically doing threshold testing to optimize your zones. Nobody wants to do that! In Summary, I think Logik is on to something. I'll be interested to see if they can franchise their technology to a larger audience and I look forward to seeing more from them.